One of my favorite crafts to make is decorative tea towels. Why? Because the possibilities are endless and you can never have enough tea towels. If for some reason you do, they also make wonderful gifts. So this weekend when I needed a little break from the master closet remodel and playhouse build, I partnered with Spellbinders to make this decorative summer tea towel DIY. And it is perfect for some summer baking! Fun decorative tea towels always make me remember gathering around the kitchen with my mom and 5 sisters in the summer. As all the produce was coming out of the garden, we would spend hours together preserving it. I remember days canning my mom’ famous salsa; hours spent cutting corn off the cobs to freeze for winter; and all the time surrounded by fun dish towels. We used our towels to clean up spills, carry pans, and to rest the hot jars on fresh from the canner. Maybe the memories of preserving the summer harvest is why I love having a drawer full of decorative summer tea towels. And as the produce in my garden is starting to ripen, I am getting ready to use all those towels to start the summer ritual at my own house. You can never have too many tea towels! I love them so much I can’t stop making them. 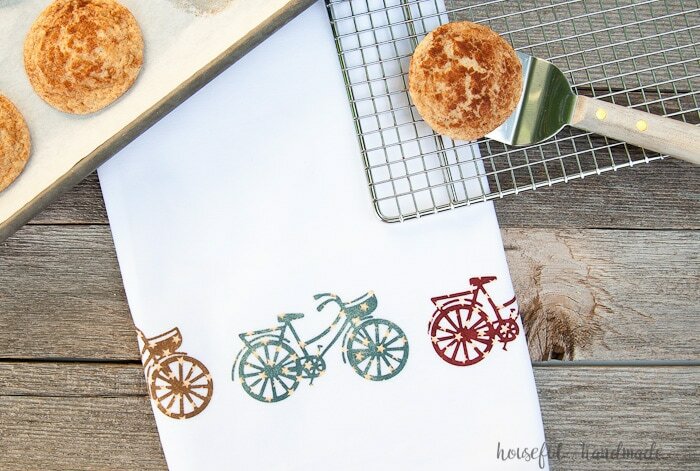 Like these gorgeous and super easy DIY tea towels made from custom printed fabric or these fun bakery tea towels painted with a stencil. 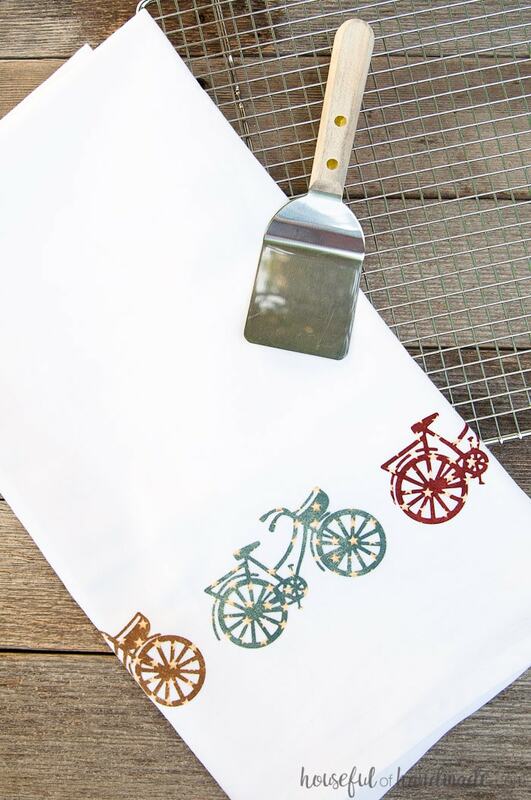 Since I have been having so much fun cutting different materials with my Spellbinders Platinum 6 machine, I decided I wanted to use it to make some more tea towels to get ready for canning season. So far I have tested the cutting strength of the steel rule dies and cut metal, denim, and leather. And last month I used the etched dies to cut vinyl. But it was time to see what else I could cut with all the fun varieties of etched dies (there are so many). I have a ridiculous amount of fabric stashed in the corners of my craft room, so I decided to put it to use! 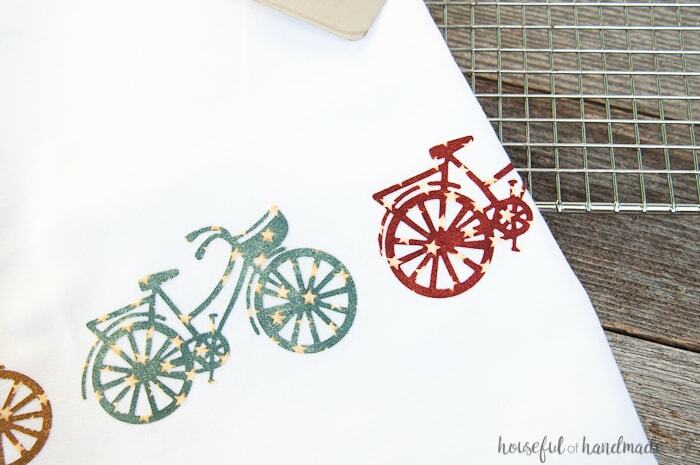 After falling in love with this sweet bicycle die from Spellbinders, I knew had the perfect rustic stars fabric to make this decorative summer tea towel DIY. 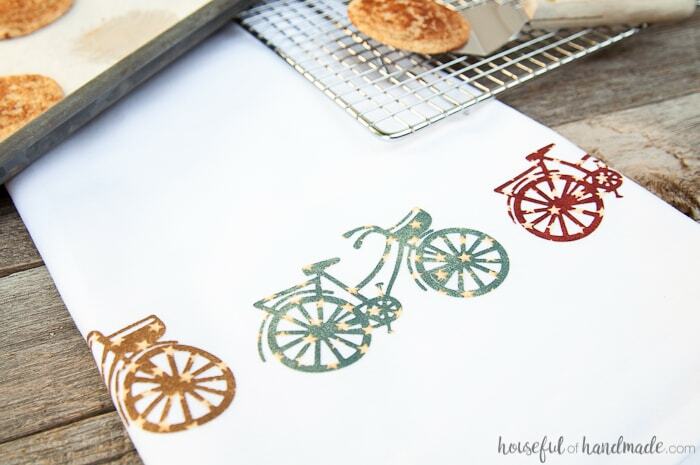 Combined with the cute vintage bicycle, it looks like the perfect summer day at the farmhouse. But before we get into the tutorial, and all my tricks for cutting fabric with the Spellbinders dies, I have some exciting news! It’s time for a giveaway! We are all celebrating summer with Spellbinders and Spellbinders is giving away 3 Platinum 6 machines. Visit the blogs below to see all the fun things you can make and then enter the giveaway below. You can enter multiple times before the giveaway ends July 18 at 11:59PM MST. Now it’s time for the tutorial! 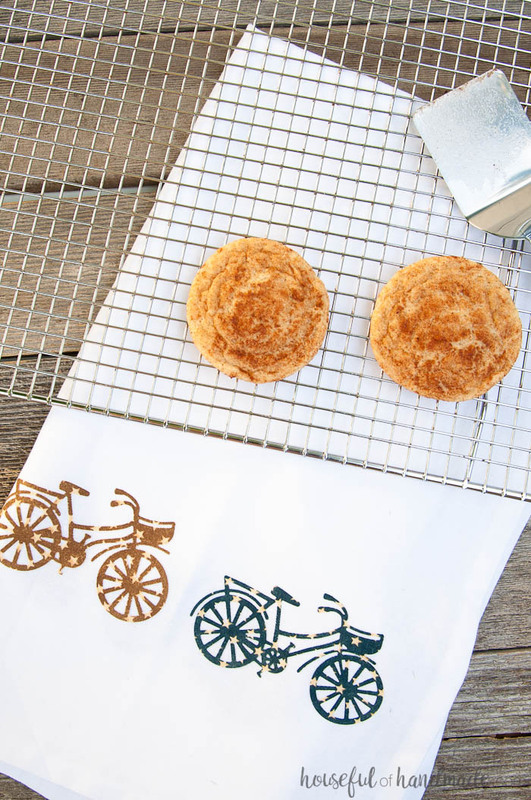 Click the arrow below to see how easy it is to make a decorative summer tea towel DIY with Spellbinders.